Buy your own Image Advanced 1400 Treadmill HERE. The Image Advanced 1400 treadmill is one of the best treadmills under $800. If you want a quality treadmill for an exceptional price, then the Image Advanced 1400 treadmill is the way to go. Treadmill Doctor rated it “one of the best $799 machines on the market”. The Image Advanced 1400 is the improved model of other Image treadmills; it is very sturdy and sets well on the floor. It is a strong treadmill that can be used for walking and running, and it comes with a 12 year motor warranty. The Image Advanced 1400 has a large sized (55" x 19") belt, a reasonably powerful 2.25-hp motor, good cushioning and a 300-pound weight limit. Not many treadmills within this price range have these features, and that is why many fitness experts rate this treadmill one of the best treadmills under $800. If you are not a regular exerciser, or you want a treadmill primarily for walking, then this Image treadmill is the way to go. It comes with the iFIT Interactive Personal Training program; which combines motivational coaching and music with effective, result driven workouts. Each workout was designed by a Certified Personal Trainer. 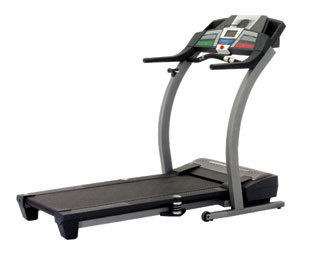 Image treadmills are well known for their lack of quality, and this treadmill is no different. Even though it comes with fantastic features, it still lacks in overall quality of the treadmill. Will the treadmill last for long time? Can it sustain a constant workout for both walking and running? That is why many fitness experts question its long term durability. And the fact that the treadmill comes with a Part and Labor Warranty that lasts only 90 days, doesn’t help either. Even though the treadmill is cheap, some time in the future, you will need to change the parts; not having a long term part and labor warranty with the treadmill is an issue. You will, eventually, invest more in the treadmill than you should. That is the downside of many Icon Image treadmills. The Image Advanced 1400 is, overall, a good treadmill; comfortable, just big enough, and effective. Even though the long term durability is questionable, it is still a treadmill that can be used for a short term, especially if you are a seasonal exerciser or just want to walk on it rather than run.